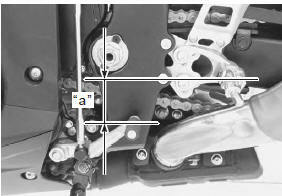 inspect the gearshift lever height “a” between the lever top and footrest. Adjust the gearshift lever height if necessary. 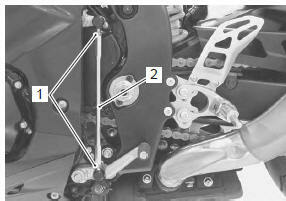 Turn the gearshift link rod (2) until the gearshift lever is 65 – 75 mm (2.6 – 3.0 In) below the top of the footrest.